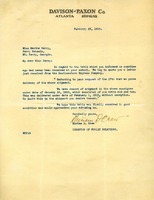 Miriam D. Crew responds to Miss Berry's letter about a table that was never received at The Berry Schools. They checked with the Southeastern Express Company, who told them that they delivered the packages on February 1st. Miriam D. Crew expresses her desire that The Schools have received the table.